Are you going to a specific church simply because that is where you are comfortable? Now, it is evidently natural for us to expect our place of worship to be comfortable as well. But what if comfort is our prime motivation for staying in or leaving the place we are? One could feel comfortable because that is where he or she was raised (see part 5). But there are many other possible reasons for this comfort: “My friends go to this church”, “this is a White people church”, “…a Black church”, “…a Hispanic church”, “…an Asian church”, “They do not bother me here…”, etc. are all possible reasons for that comfort. Oh, and how about “I am a Baptist…”, “I am a Seventh-day Adventist”, “I am a Catholic”…and my favorite of all…”We are a non-denominational church” (never mind that they do have a name, which sometime is even fancier than the others!)? The fact of the matter is that comfort may come at a very significant price! Because, as God puts it in 1 Thessalonians Himself, we should “test all things”, otherwise, we may hold to that which is bad…and that is pretty bad! 1 Thessalonians 5:20, 21 – Despise not prophesyings. Test all things; hold fast to that which is good. We are to test everything. And the most important thing we can and should test is what we are being taught. Our teaching does not end when our pastor closes his sermon. NO! 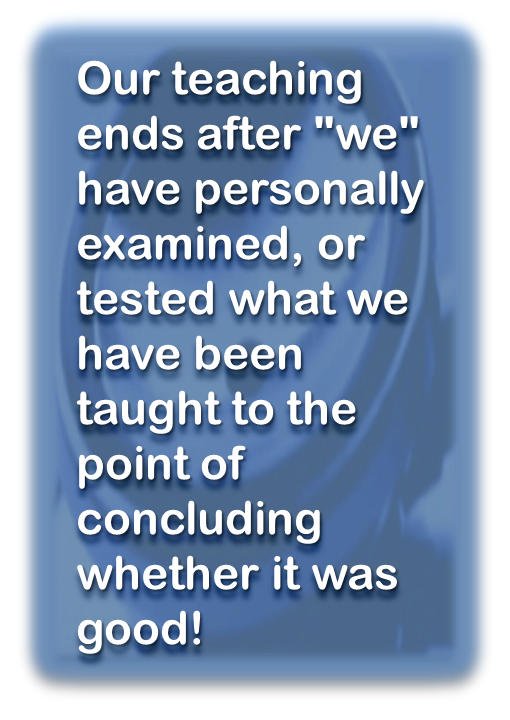 Our teaching ends after “we” have personally tested, or examined what we have been taught to the point of concluding whether it was good! And granted, that could take some time. But when was the last time you examined your pastor’s teaching? That the act of testing is mentioned here in the immediate context of prophecies speaks volume of its importance when it comes to what we are taught. Comfort should not undermine our ability to test everything. There are many traps laid before those who seek to grow spiritually. This series highlighted only six of them. But those six are very subtle. And in many of them, our very churches are deeply involved in their effectiveness. The secret is knowledge, unfiltered knowledge. We need to be taught accurately, and it is actually up to us – and not so much the churches – to make sure that this happens. 2 Timothy 2:15 – Be diligent to present yourself approved to God as a workman who does not need to be ashamed, accurately handling the word of truth. There is a reason God gave us His Spirit. Thanks to it, no matter the trap the adversary may lay before us, we have the ability to live up to God’s expectation, as He expresses it in 2 Timothy 2:15. Take control of your spiritual growth, and be what God called you to be.